The complex process of solicitation, bidding and award of government contracts can challenge even the most seasoned of contractors and government officials. Navigate the maze of requirements, statutes, regulations and case law with confidence, with this authoritative treatise. This book has reached that rare status of a classic --devoted exclusively to formation of government contracts. To say it is full of case, statute, and regulatory cites would be an understatement. 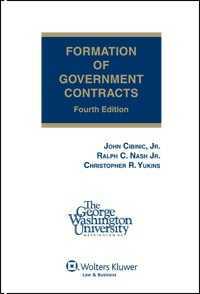 Formation of Government Contracts, from The George Washington University Law School Government Contracts Program and CCH, cuts through confusing jargon and government "legalese" to deliver a practical guide to forming a sound government contract. Written by pre-eminent experts in government contracting, the authors' unbiased analysis of important case law and decisions provides an overview of the current legal environment and helps you put everything in perspective.